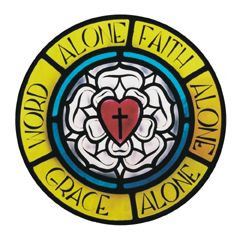 Lutherans believe that God is three in one, or triune. Lutherans believe that the Son of God became a human being to suffer and die for the sins of the world so that all who believe in Him will not perish but through His substitution for us on the cross we are given forgiveness and eternal life. Lutherans believe that we are saved by God’s mercy and forgiveness and not by works of righteousness to atone for our past or even by a personal action of deciding to follow Jesus. Rather, the work is entirely God’s. This gives rise to the Lutheran phrase of “Grace alone!”. Lutherans believe it is important to proclaim their faith to the world in an understandable manner. And so Lutherans have been known to write down statements explaining what they believe and where they find these beliefs in the Bible. The most important of these statements are found in the Book of Concord, which is a collection of Lutheran theological declarations. These are sometimes referred to as the “Confessions” and Lutherans who believe that these writings are a correct explanation of what the Holy Scripture teaches on certain topics are often called “confessional”. Lutherans also take their various practices from Scripture. We do recognize that God’s Word does not address every matter of practice. Our position is that if God’s Word has spoken to a matter we must follow God’s Word on that matter. But where God’s Word is silent, there can be liberty for practice as long as this is done responsibly for the sake of proclaiming the Gospel into the world.